A Series of Unfortunate Events continues as the three Baudelaire orphans are brought to their latest guardians, Jerome and Esme Squalor, who reside at the penthouse of 667 Dark Avenue. Whatever is “in” is all that matters to Esme and Jerome does not protest. The children are forced to wear pinstripe suits and to drink aqueous martinis and to take the stairs to the penthouse when there is a perfectly serviceable elevator. But they waste no time and Violet thoroughly investigates every room in the penthouse, trying to find a clue about the Quagmires. 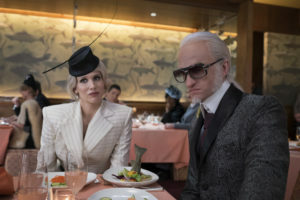 Because this is A Series of Unfortunate Events, Count Olaf is still around, this time disguised as Gunther, a foreign auctioneer Esme has hired. As usual, no one believes the Baudelaires when they insist that this is Olaf because there is a city-wide manhunt for him. In a fun sequence at an “in” restaurant called “Cafe Salmonella,” where all the food is salmon-based, Olaf and his henchmen are delayed as the volunteers try to find the Quagmires. 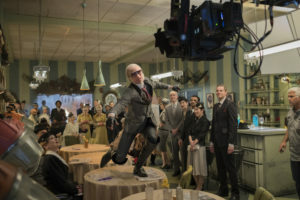 Larry the waiter and Jacquelyn are there too, and Count Olaf launches into a musical number just like he did at the beginning of season one. Later, the orphans find the Quagmires in a cage at the bottom of an ersatz elevator and try to hatch a plan to rescue them. But as usual, luck is not on their side. Jerome Squalor falls asleep and when they try to ask Esme for help, they find out that she is actually in league with Olaf. Meanwhile, enterprising librarian Olivia has become a new recruit in the secret organization of noble volunteers. She takes a taxi ride with Jacques Snicket who lets her in on the story of the Baudelaires. At this point, she knows more than the children. But they discover that there is a secret tunnel that connects 667 Dark Avenue to their old house. The audience also discovers that Jacques Snicket also has a tattoo of an eye on his foot. The episodes culminate with Esme and Gunther’s auction of “in” items where the orphans believe the Quagmires are about to be sold. They escape the tunnel and show up in time to bid on an item where they believe their friends are being kept. Larry the Waiter, Jacquelyn, Jacques, and Olivia also show up. But alas, this is A Series of Unfortunate Events, and the package turns out to be a lot of Very Fancy Doilies. It was a big red herring after all. Olaf and Esme escape, Jerome proves too cowardly to be a proper guardian, and Mr. Poe cheerfully assures the Baudelaires that a new arrangement for their guardianship has been made.